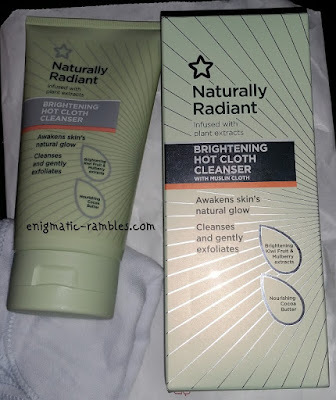 I really like Superdrug Vitamin E Hot Cloth Cleanser and so when I saw this version I thought I would try it out. The tube comes with 150ml of product and a muslin cloth. Formula is thick and creamy, spreads well over the face and does remove make up. All that said I didn't like this product, especially compared to the original version. There is 50ml less product in this tube and this version costs more money. The scent is very strong and masculine which irritates my eyes which isn't good for removing eye make up. So while I am able to use the product up it isn't one I would repurchase or recommend. The review for Superdrug Vitamin E Hot Cloth Cleanser can be read here if you would like to.